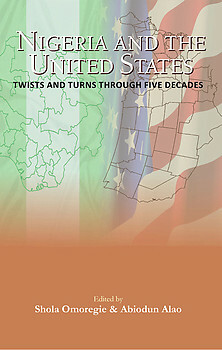 Nigeria and the United States: Twists and Turns through Five Decades is being republished on license from Africa Peace Support LLC. The volume provides a detailed and in-depth assessment of the relationship between the world's sole superpower and Africa's most populous nation. The book chronicles the early contacts between the two countries and then assesses how that relationship has evolved, enlisting the services of some of Nigeria's most notable international relations experts and scholars in the Humanities who provide chapter contributions. The result has been a highly engaging documentation of this critical bilateral relationship.
? To document all the ramifications of America-Nigeria relations over five decades bringing out the ups and downs of the relationship and their consequences. ?To assess the impact of the ?past? on the ?present? and the future of Nigeria-America relations. This is particularly important because a complex tapestry of dreams and desires seem to govern the political, economic and security relations between the two countries. The methodology adopted is to identify all the key aspects of the relationship between the two countries and provide a detailed analysis of the key issues that have underlined the social, economic, political, diplomatic and military relations between the two countries. Although the focus is mainly on Nigeria and the United States, the text also touches on situations in other countries that inevitably became intertwined with the American Nigeria relations, especially the situation in Southern Africa during the era of apartheid and minority rule and Liberia, during the country?s bitter civil conflict. AMBASSADOR SHOLA J. OMOREGIE is the former Representative of the United Nations Secretary-General in Guinea-Bissau and Head of the United Nations Peacebuilding Support Office in Guinea-Bissau (UNOGBIS) from 2006 - 2008. He is founder and President of Africa Peace Support, LLC, an international consulting firm. He retired from the United Nations in December 2008, having had a dedicated and distinguished service at the United Nations Secretariat spanning over three decades ? 1978 - 2008. From 1978 ? 1983, he served in Botswana as the first Resident Representative of the United Nations Commissioner for Namibia. He subsequently served in various capacities at the United Nations, including as Representative of the United Nations Commissioner for Namibia in Angola (1988-1990); Secretary of the UN Special Committee on Peacekeeping Operations (1992-1994); and Chief of Branch of the UN Security Council Charter Research Branch. He was educated at the University of Lagos, Lagos, Nigeria, where he earned a B.SC (Honors) in psychology. He is the author of a new book, Witness to Transformation ? My Years at the United Nations and publisher of Africa Peace and Security Monitor, a quarterly political and security analytical newsletter. ABIODUN ALAO is Senior Research Fellow at the King?s College London. He was educated at the Universities of Ibadan, Ife and London where he holds a Bachelors in History, Masters in International Relations and Doctorate in War Studies respectively. He is widely published in the subject area of African Security. Among his books are: The Tragedy of Endowment: Natural Resources and Conflict in Africa published by University of Rochester Press, in 2007, Peacekeepers, Politicians and Warlords: The Liberian Peace Process (co-Authored with John Mackinlay and Funmi Olonisakin) published by the United Nations University Press in 1999, Africa after the Cold War: The Changing Perspective on Security (co-edited with Adebayo Oyebade) published by Africa World Press in 1998 and The Burden of Collective Goodwill: The International Involvement in the Liberian Civil War, published by Ashgate Publishers in1996.